Mr. Rudelmar Bueno de Faria (center), General Secretary, ACT Alliance, speaks at the opening session of the Symposium held at the United Nations headquarters, in New York, on 29 January. “Financing for Development is not a magic bullet. There are many dimensions to it which we must harness to ensure that these investments are transparent and effective”, said Rudelmar Bueno de Faria, General Secretary of ACT Alliance, during a session of the 5th Annual Symposium on the Role of Religion and Faith-Based Organizations in International Affairs, at the United Nations (UN) headquarters, in New York, on 29 January. “Among these dimensions is the added value and leverage that faith-based communities bring to the spirit of the 2030 Agenda. A value system that puts the wholeness of the human being at the center”, added de Faria. The fifth edition of the Annual Symposium focused on the theme “Financing for Sustainable Development: Towards an Economy of Life” and was co-organized by ACT Alliance, the General Board of Church and Society of the United Methodist Church, the General Conference of Seventh-Day Adventists, Islamic Relief USA, the United Religions Initiative and the World Council of Churches, in partnership with the United Nations Inter-Agency Task Force on Religion and Sustainable Development and the NGO Committee on Financing for Development Conference of NGOs. 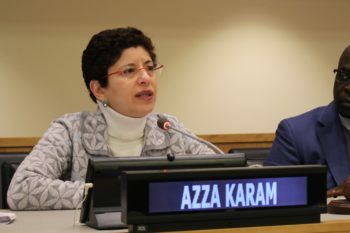 Dr. Azza Karam, Coordinator, United Nations Inter-Agency Task Force on Religion and Development. The Financing for Developmentprocess is centered around promoting a comprehensive and integrated approach to ensure the policies and resources, both national and multilateral, needed for sustainable development. This includes the 2030 Agenda and the Sustainable Development Goals (SDGs). In 2017 the World Bank estimated the global Gross Domestic Product (GDP) at roughly $80 trillion in nominal terms. The world’s top 10 economies together combine a huge two-thirds of global GDP. The United Nations Conference on Trade and Development (UNCTAD) reports that achieving the Sustainable Development Goals (SDGs) will take between US$5 to $7 trillion, with an investment gap in developing countries of about $2.5 trillion per year. Based on these data, we can see who can drive the implementation of the SDG agenda and the future of humanity. “Governments and the public sector will continue to play a key financing role, particularly in the delivery of essential public services. However, there is an evident need and scope for the private sector to engage in financing the SDGs to help close the gap”, said de Faria. “The SDGs offer a common framework to harness the unique assets, networks, and value-system of faith-based communities. 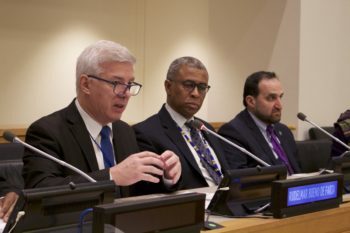 The financial contribution of Faith-Based Organisations (FBOs) to the SDGs is remarkable, not only because of the impressive financial contribution we could reach, but also because of FBOs’ approach to sustainable development, which can multiply the impact of the financial investments”, he added. Faith based organisations, including the ACT Alliance, contribute billions of dollars of work each iear to the achievement of the SDGs. In addition, their presence in communities and the social and societal role places FBOs in a unique position to leverage their work for even greater gains. Local faith leaders play a key role in achieving gains towards many of the SDGs, including goal 5 (Gender Justice), 13 (Climate Action), and 16 (Peace, Justice and Strong Institutions). Financing for Developmentis a challenge that will require the full engagement of a wide range of stakeholders, each pursuing the same ultimate objectives albeit in different ways. The annual symposium has become a regular fixture on the international calendar, and an expression of the increasing synergy between religious communities, faith-based organizations and the UN.